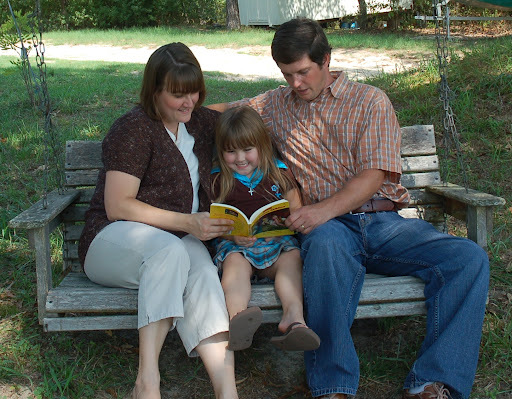 Homeschooling is one of our most favorite and amazing parts of life here on the farm. I get lots of questions about when, where, why, and how we home school. So, in this blog, I thought I’d share with you a little about school on the farm. School on the farm is definitely not a one person job. It involves our whole family. Joey and I both teach Elizabeth every day; and sometimes, Elizabeth teaches us! We all are very committed to education and love learning, so it truly is an exciting adventure for us all. We use a Christian curriculum from a wonderful company called Sonlight (www.sonlight.com). Our daily subjects cover literacy, math, science, social studies, Bible study, history, and geography. We have a few supplemental materials like Weekly Reader (www.weeklyreader.com) that we do as well. Since I teach second grade at a public school during the day, Elizabeth is with Joey on the farm. Joey teaches Elizabeth her formal science lessons and part of her literacy. He also reviews any skills that need to be taught again. Living on a farm has provided Elizabeth with hundreds of informal lessons in everything from growing plants to helping count change at the farmer’s market. After the formal lessons are over, Elizabeth gets to enjoy being in the fresh air and sunshine while working (and playing) with Dad. When I get home in the afternoon, Joey heads back outside to do chores or complete tasks that don’t require the help of a five year old. Elizabeth and I head into the schoolroom to start on the rest of her schoolwork. The schoolroom didn’t start out to be a schoolroom. It just evolved over time and somehow turned into one! Elizabeth’s grandpa built her a little desk and a chair that is just her size. Her desk faces two big windows that look out over the garden. She loves to sit at it to do her paper work. We have big comfy pillows on the floor that we like to sit on to do lessons and read. The walls are filled with Elizabeth’s school papers and drawings. One side of the room has bookshelves that go from floor to ceiling. The bookshelves are filled with children’s books and magazines. The very bottom shelf holds a large collection of puzzles and games. Elizabeth’s dollhouse sits snugly in one corner of the room. Technology is also a part of our school. We use the computer, I-pad, and Internet quite frequently. After our evening meal, we take a few minutes to finish up our formal schoolwork. Learning never really stops at our house. It seems that there is always something that Elizabeth (or Joey or I) is wondering about! One of the last things that we do together each day is share bedtime stories with Elizabeth. This is also part of her school curriculum, but the stories are so enjoyable that we all love hearing them as a bedtime story! Even though Elizabeth loves being at the farm, she also needs to have socialization with other children. She attends dance classes, enjoys her Sunday school class at church, and loves having friends over to play. She also likes going with us to help at the Farmer’s Market. Homeschooling isn’t for everyone, but it was just right for us. Learning is a journey that never stops. No matter how old you get, or how much you know, there’s still more that you can learn. It’s such an exciting blessing to be able to lead our little one on her first steps down the pathway of knowledge. We’re looking forward to homeschooling for many years to come! during Elizabeth’s first month of Kindergarten. The plain truth is that I am rich. When I say rich, I mean rich; not just comfortable or well-off. Just how much money is in my bank account? Hmm….let’s see….if I had to calculate, I’d say that there’s at least twenty dollars in there at almost all times. I can hear you now! You’re saying, “What?! Twenty dollars does not qualify you as being rich, well-off, or even very comfortable!”. Well, if you’re talking about money, that may be true. But, as we all know, there’s more to being rich than having lots of money! Our life on the farm is incredibly rich in so many different ways. One of our greatest treasure troves is the love of our family. In this day and age, a million different things such as drugs, sour relationships, and long distances threaten to tear families apart. I am so thankful that our immediate family members live close and love one another. My daughter Elizabeth’s life is so rich because of the time she spends each day with loving grandparents and great grandparents. Joey and I are also richer because of their daily love, support, and wisdom. Speaking of Joey, he makes my life richer every day. The commitment we made to each other in marriage is a treasure worth more than diamonds or gold. Another area that we are rich in is good health. This is something that is often taken for granted. What a blessing it is to be able to have a healthy mind and body! If you have ever been really sick, or cared for someone who was really sick, you know how true this is. Good food goes right along with good health. There is certainly plenty of good food on the farm! Whether it’s freshly picked from the garden or preserved in a mason jar on the pantry shelf, having plenty of delicious and wholesome food to eat is better than a million dollars! It’s absolutely glorious to be able to get a fresh egg from the hen house or to pick and eat a juicy blueberry that is still warm from the sunshine! When night falls on the farm, we display our riches when our secret cache of diamonds come out! Secret cache of diamonds?! That’s right. We have thousands of them. They’re called stars. The sky above the farm sparkles with beautiful glittering stars. A dazzling jeweler’s necklace couldn’t outshine them! If you haven’t stepped outside to look at them for awhile, please do. They are still there, just as beautiful and marvelous as ever. As the stars begin to come out, our own personal symphony orchestra begins to play. The little frogs, bugs, and a soft breeze make a music that is second to none. Hearing Elizabeth’s laughter as she plays in her grandfather’s barn. Snuggling deep into a warm bed as a cold winter wind howls outside. Watching the vibrant, green, plants inside the greenhouse sprout and grow while outside snow covers the ground. Laying on the couch on Sunday afternoon and falling asleep to the ticking of the wind-up clock. Listening to Grandma, Grandpa, and the Aunts and Uncles tell stories about each other! Looking out the kitchen window and seeing Joey plowing the garden with the tractor and Elizabeth playing in the yard. Sitting in church on Sunday and singing the beautiful old hymns of praise. Having a campfire cookout in the backyard. Dancing with Elizabeth to our favorite records. Eating a frosty bowl of homemade vanilla ice cream on the front porch on the Fourth of July. The list could go on and on! As I said earlier, there’s much more to being rich than having lots of money. For me, the best kind of riches, are the ones that can be found right here on the farm. *What about you? Are you rich? If so, what do you consider your greatest treasure? Green beans may seem like a simple vegetable, but they play a big part in our life here on the farm. As you will soon find out, there’s more to the tiny green bean than meets the eye! In the summer, I like to think of myself as a “green bean pickin’ machine”! I like this title so much that I even wrote a song about it! A row of green beans can seem ten miles long when you’re picking them in the blistering, hot, summer sun. I always start off well enough, but somewhere around the middle of the row, I start walking on my knees. By the end of the row, I’m usually scooting along on my seat – and that’s just row number one. Usually there are somewhere around eight to ten rows to make it through. Who needs a fancy gym membership when you can pick green beans?! Needless to say, the job is long and hot. Eventually, Joey and I (and whatever unsuspecting family member we can rope into picking) get all the green beans picked. We love to can fresh green beans for the winter and they are a staple item on our farmer’s market table during the summer months. At the farmer’s market, green beans have taught us some valuable lessons in social skills. Most folks that frequent our booth at the market have grown and picked green beans before. Needless to say, they are thrilled to pay $3.00 for a heaping quart box of our fresh green beans. They’re even happier that they are grown without any synthetic chemicals, and are thrilled when Joey puts an extra handful of beans into their sack to “top it off” before he hands it to them! But….there are always one or two folks that seem to want to be hard to please. Those folks don’t like the price of the green beans, or the way the green beans look, or the way the quart box is filled, or the color of my apron, or….well, I think you get the idea. Instead of being rude, we try to smile politely and explain why things are the way they are at our booth. Sometimes this helps and sometimes it doesn’t. Either way, it’s a lesson in getting along with others. 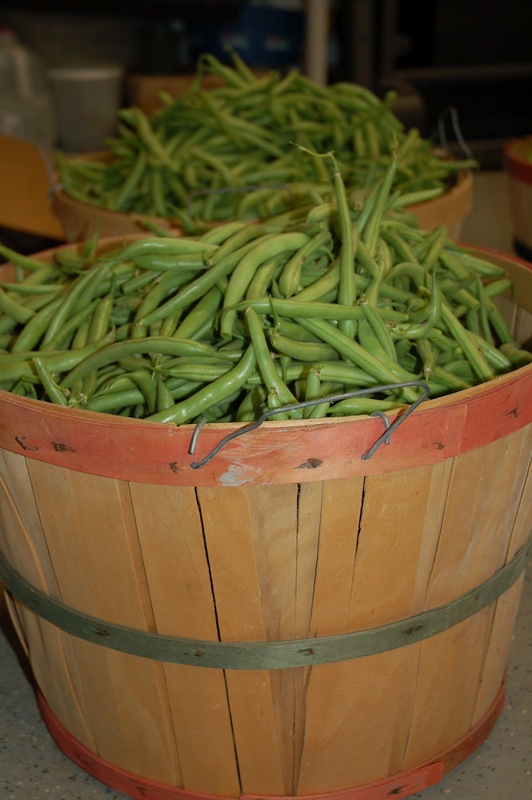 Green beans are good to sell at the farmer’s market to help earn some money for our farm, and they also help out with the family finances in another way. I mentioned earlier that we typically sell a heaping quart box of green beans for $3.00. I also mentioned that they are one of my least favorite vegetables to pick in the hot summer sun. So it just seems natural that when I am trying to decide if I should make a purchase or not, I use a complex mathematical formula that I call “Green Bean Conversion”. To use Green Bean Conversion, I simply translate the purchase price of an item into boxes of green beans. For example, if I am thinking about making a $30.00 purchase, that would translate to 10 heaping boxes of green beans that would have to be picked. More often than not, this formula quickly stops me from wastefully spending money. I even think that it might be a useful formula that our government would like to consider to help with their spending problems. If all the congressional folks had to pick enough green beans to cover their expenditures, I think that would really help them to make wise choices about how they spend our countries money. You may not have realized that green beans have so many uses! From social skills to the family finances, green beans can help with almost everything. You can get in shape while picking them, improve your social skills while selling them, curb your spending habits by doing a mathematical formula with them, and…..the best part….enjoy a delicious meal while eating them! Some of our freshly picked green beans! Tonight, we ate at our favorite dining spot. Our special table by the window had been reserved just for our family. Our food was cooked to perfection and seasoned just how we like it. The atmosphere was relaxed. No one even blinked an eye when I wore my pajama pants and an old sweatshirt instead of dressing up. Where is this fabulous place? Well….it’s located very close to where we live. In fact, it’s located right in our house. It’s our dining room. While our dining room isn’t an actual restaurant, it does happen to be our families favorite place to dine. One of our simple pleasures in life is cooking and preparing a delicious nightly meal together. Most of the ingredients we use are grown right here on the farm. Cooking is a family affair on the farm. We all have our favorite items to prepare. Joey’s speciality is meat, mine is vegetables, and Elizabeth really loves to make deserts. Unfortunately, it seems that in today’s world, enjoying a nightly meal around the dining room table is almost a thing from the past. This is beyond sad and senseless. If everyone works together, it only takes a little time and effort to prepare a simple, nutritious, and delicious meal. There are so many benefits that come along with eating and preparing a meal together. It is a great time to visit with your family and catch up on what has happened during the day. It’s also an excellent teaching time for children. They can help measure and mix ingredients while the meal is being prepared. Table manners and conversational skills can (and should!) also be modeled and practiced during meal time. Another great benefit of eating at home (besides wearing lounge clothes!) is the cost. If you prepare your meals from scratch, the cost can be very cheap. Now, usually when I start talking about making things from scratch, people turn pale and start to look at me like I have two heads. Before you do that, take just a moment to keep reading. Preparing meals from scratch isn’t as hard as you think. In fact, it’s not hard at all. Cooking from scratch usually requires basic ingredients such as flour, sugar, cheese, vegetables, etc. You don’t have to be a master chef to cook from scratch. You can grab almost any cookbook and find basic recipes for just about everything. One of my favorite old standbys is The Better Homes and Gardens Cookbook. It’s my go to book for everything from pancakes to pie crust. Another thing that you can do to help create delicious, cheap, homemade meals is to can and preserve your own food. I usually get the “two headed” look from people when I mention this also. Really, truly, and honestly, it’s just not that hard! You will be absolutely amazed at the difference between food that you have canned or preserved yourself and store bought food. There is just no comparison. If you have never tried cooking from scratch, or canning/preserving your own food, you’ve just got to try it. It will truly change your life! One of the biggest complaints that I hear when I talk to people about eating at home is that they don’t have enough time or are to tired to cook. Something that really helps with both of these problems is preparing meals ahead of time. If you know that you will be pressed for time or worn out during the week, an easy thing to do is to cook and freeze some meals ahead of time. Then, all you have to do is heat it up in the oven. Some of our favorite meals to do this with are chicken pot pie and mini-meat loafs. It is wonderful to be able to come home at the end of a hectic day and still have a delicious home cooked meal. Another great time saver that we use is a crock pot. We love slow cooking pot roast, potatoes, and carrots. Now, I know that some of you cook from scratch, can or preserve everything in sight and are reading this and saying, “YES!”. I also know that some of you eat out way more than you’d like to and are reading this and thinking, “I wish my family could eat at home more.” Well, guess what? You can! Go find your dining room or kitchen table. Odds are, it’s still right where you left it. Sure, it may be piled up with papers, sports gear, or backpacks, but it’s under there…somewhere. Clean it up and wipe it off. It’s been waiting for you to come back! Take the plunge and cook at home with your family this week. Start tonight! Your dining room table is calling. You can have your favorite meal, spend some wonderful time with your family, save some money, and……you can even wear your pajama pants! It was around 8 years ago, one cold February night, that a young couple stood in their front yard. Big, white, flakes of snow fell softly around them, and icy grass crunched under their feet. All around them, sirens wailed, radios squawked, and black smoke blew, as the young couple slowly watched their house, with everything in it, burn to the ground. This young couple happened to be Joey and I. What a night that was! We lost our house and everything in it, except for a few things that we managed to grab. At the end of that awful night, all we were left with was a big pile of worthless ashes, but in the days that followed, the people in our town and our family members would give us treasures more precious than gold. The giving of treasure started the very night of the fire. On that particular night, the gravel road was iced over, and the fire trucks could barely make it to our house. One of the emergency vehicles even slid off in the ditch. Those firefighters braved the flames in the freezing weather. They worked through most of the ice cold night fighting the fire. By the time they were done, their face masks and gear were literally frozen on with sheets of ice. I remember the fire chief coming in, absolutely exhausted, and telling us how sorry he was that they couldn’t save our house. One of our treasures that night was realizing what amazing, unselfish, and dedicated people that our local volunteer firefighters are. While the firefighters were battling the flames, I did what anyone who was scared and worried would do: I called Mom and Dad. Even though the roads were icy and dangerous that night, my parents were determined to get to our house. They started out right away and, after slipping and sliding on the highway, finally made it over to comfort their only daughter. I was greatly comforted by them, but very concerned that they had taken such a risk to come. When I told them this, they looked at me like I was crazy and said, “You needed us.” They were right. Joey’s parents happened to live right next door to us, and were also a great comfort. Having the comfort and support of our parents that night (and always) was a treasure worth more than the greatest riches. We spent the rest of that black, smoky night with Joey’s parents. The next morning, another treasure was waiting. It was brought by a close neighbor. This time, the treasure was the gift of generosity. Our neighbor knocked on the door early that morning, gave Joey and I big hug, and with tears in his eyes, he handed us the keys to his house. Yes, that’s right, his house. Needless to say, we were overwhelmed. He told us that he was heading out of town for his work, and we were welcome to stay in his home for as long as we needed to. We gratefully accepted. Not only did this amazing man open his home to us, he also refused to allow us to pay the monthly bills. That day, and the days that followed, were absolutely filled with people that deeply touched our lives and hearts in a million different ways. Many neighbors stopped by to see if they could do anything to help, and to give us a handshake or a hug. There were so many friends and family members that gave us unspeakable riches in the forms of kindness, unselfishness, generosity, and love. Here are just a few examples of the amazing folks that we are blessed to call family and friends. One man drove his loader over five miles to help us clear away the rubble after the fire. The local schoolteachers got together and made a “teacher hope chest” filled with things like stickers, books, and lessons for my future classroom since all the things I had collected had burnt. The morning after the fire, Joey’s aunt went to the store and showed up with bags filled with basic items like deodorant, underwear, and fresh clothes. A few days later, she and another aunt went on a small shopping spree and surprised us with several new outfits each. A close friend sent us each a brand new Bible. Countless people sent money, clothing, or household items. Even folks that we suspected really didn’t have much to spare, sent us things. It tore at our heartstrings to receive lovingly cared for blankets and household items. Each one of these things found a special place in our new home. As I write this story, tears fill my eyes, and my heart once again overflows at the memory of the goodness of friends and family. In the year that followed, Joey and I lived at our neighbor’s house, with Joey’s parents, and at a house my parents had in another town. Life continued on, but it was much different than before. 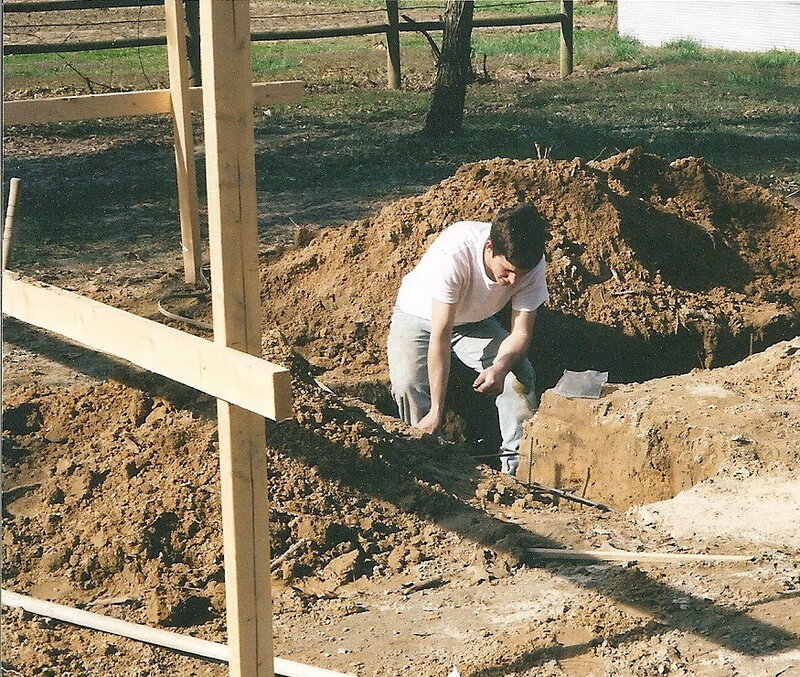 Every night after work, and every weekend, Joey and his Dad worked on building our new home. Joey’s Dad is a master carpenter and his work is unbelievable. He can build and design anything from a dollhouse to a mansion. He spent hours designing and building our home. Carpentry is a skill that runs in Joey’s family. His uncles hung and finished the drywall for the entire house. The wiring for our home was done by an electrician, who happens to be Joey’s grandpa. When the house was completely finished, my Mom made custom curtains for our entire home. Not only did our family members do all this, they did it for free. Because of our families, our house is more than just a house. It is a labor of love, built by their own hands. What a treasure! Having our house and everything we own turn into a pile of ashes is something that I hope we never have to go through again. Just in case you’re wondering, the cause of the fire was never found. Our best guess is that it was something that went wrong with the wood burning furnace. Even though we may never know what went wrong with the furnace that caused the fire that night, one thing we do know is this: we are blessed to live in a place where treasures abound! Joey working on rebuilding after the fire. He is laying rebar for the foundation.